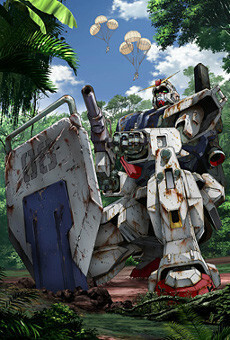 UC 0079 - After the success of Operation Odessa, more and more Earth Federation soldiers are sent to earth to free it from the hands of the Principality of Zeon. As Zeonic troops retreat to unknown parts of the world, it's up to the Earth Federation Ground Force to find them and exterminate them. Ensign Shiro Amada is made leader of the 08th MS Team, leading a team of Ground Type Gundams into battle. His mission: to distract the enemy and find a mysterious new Zeon weapon. But can he complete it when he falls in love with a Zeon pilot, named Aina Sahalin?